In 2012, The Irish Journal of Psychological Medicine became the official research Journal of the College of Psychiatrists of Ireland. In March 2013, Cambridge University Press (CUP) partnered with us to publish the Journal, both online and in print. College members have free access to full Journal content at Cambridge Journals Online, and also receive a hard copy. 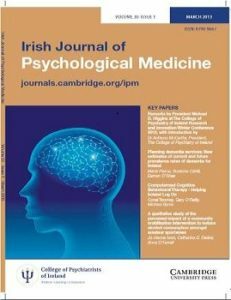 The Irish Journal of Psychological Medicine is an international journal dedicated to publishing original scientific contributions in all fields of psychiatry and related basic sciences (biological, psychological, and social sciences). Its main aim is to disseminate original scientific research to a national and international readership with the objective of improving clinical practice and service development in mental health. The journal advocates for delivering high quality clinical care and improvement in mental health services, and is committed to keeping the field of mental health vibrant and relevant by publishing research on novel topics. Particular strengths and unique features of the Journal include a focus on Clinical Psychiatry, Youth Mental Health and History of Psychiatry, with regular features and special issues devoted to these topics. With a progressive focus for mental health, the journal provides important reading for clinicians, researchers, policymakers and all professionals with an interest in mental health. All back issues from Volume 6 1989 are now available online. Clicking here or on the icon will bring you to the Journal’s online site. Please ensure you have logged in as a Member first to gain full access to all IJPM content. As research journal of the College of Psychiatrists of Ireland, the Irish Journal of Psychological Medicine continues to publish high quality original research data papers from around the world, and is committed to publishing papers in a range of different formats, including editorials, review papers, educational papers and book reviews. The Journal is also committed to publishing historical papers examining key topics in the histories of psychiatry.